UDM Downloads > ReaSoft PDF Printer Standard! With ReaSoft PDF Printer you can create high quality PDF from any application that prints, use optional PDF saving dialogue for detailed document design, combine documents, drawings and rich media content into a single PDF document. All you need to do is print from any Windows application to create a PDF document. 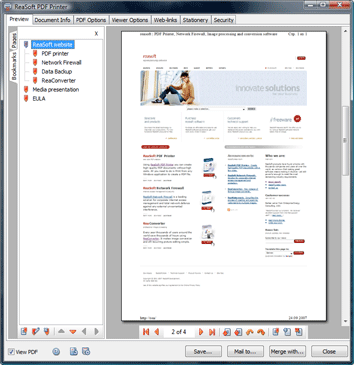 Besides, ReaSoft PDF Printer gives you the power to customize output PDF documents, offers options for PDF security and font embedding, which ensure that the final files are safe and look the same on any computer.